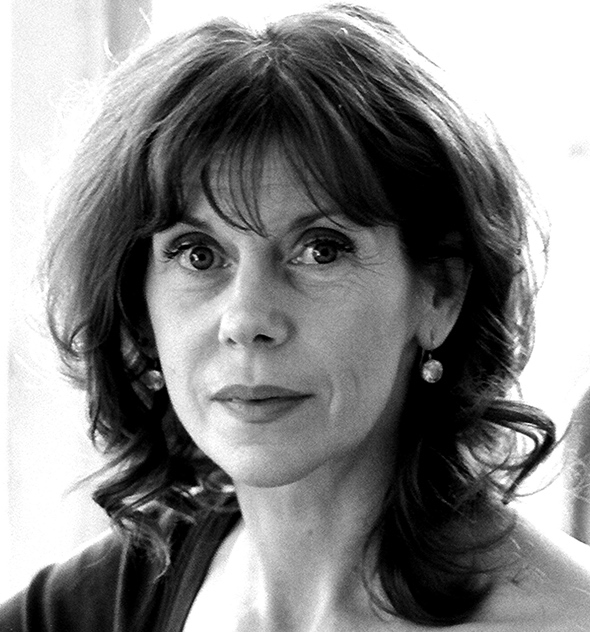 Interview: Praising the succinct poetry of playwright David Greig’s drama, Irish actress admits it was daunting to be cast as the hope of Scotland whose royalty is disputed under an English occupation force. 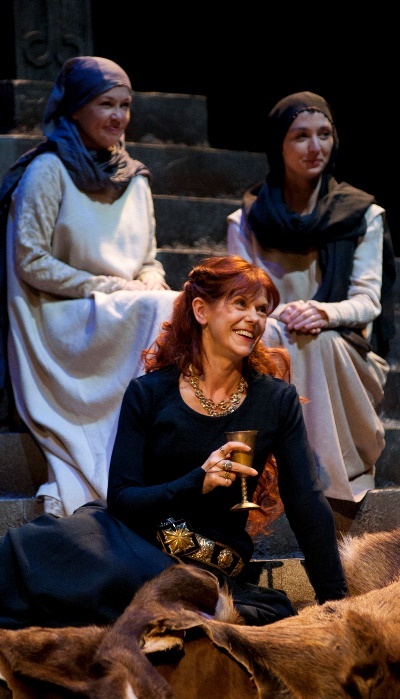 Produced by National Theatre of Scotland at Chicago Shakespeare Theater, through March 22. 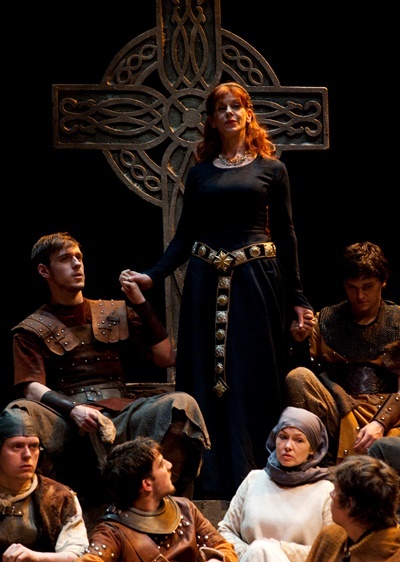 The scale of the thing, actress Siobhan Redmond was saying of David Greig’s play “Dunsinane,” is enormous. No less might be said of her expansive, shrewd performance as the embattled widow of Macbeth who, weaponless, must prevail against an English force come to install her rival Malcolm on the throne of Scotland. But filling that psychological frame, says Redmond, required some deep breaths and a leap of conviction. The dealer is the English commander Siward, Earl of Northumberland (played by Darrell D’Silva), who quickly has Gruach in his grasp. But just as quickly, this smart and willful queen has him in her thrall. Their cat-and-mouse game evolves into the dramatic core and theatrical delight of all that follows. In one pivotal, indeed defining, moment, Siward storms into Gruach’s chambers in hot exasperation over her refusal to step aside and allow her supporters – numerous, resistant and invisible – to recognize Malcolm’s right of kingship. He’s also vexed with Gruach for hiding her son, whom she declares the rightful king. As their argument plays out, he stinging and she floating, the high commander’s heat gets sharply rechanneled. “He comes in murderously angry with her and they end up spending the night together,” says Redmond. “When we play that scene, I have to be completely receptive to Siward. I must drive the scene while appearing not to drive it – I don’t have the driving language, he does. Siward is quieted, disarmed, redirected by Gruach’s womanly wiles. She seduces him. “Actually, they’re drawn together. They have things in common,” says Redmond. “David Greig emphasized that in rehearsals. “Siward is attractive and knows that about himself. She is similarly terrifying and alluring because she is so powerful, and that’s quite interesting to me. 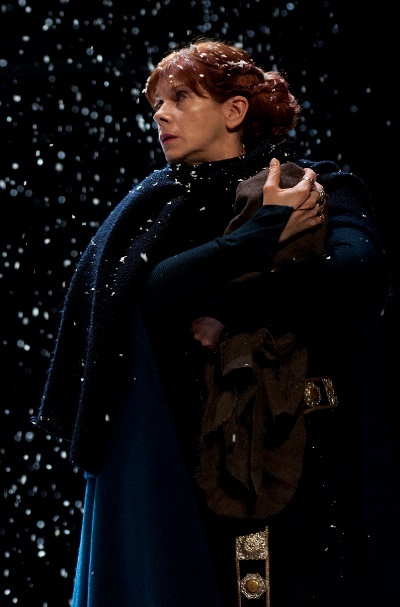 Redmond is the only actress to have portrayed Gruach since the premiere of “Dunsinane,” named for Macbeth’s great castle, five years ago. Surprisingly enough, she has never played Shakespeare’s Lady Macbeth, whose single-minded ferocity becomes more restrained and politically measured in her reincarnation by Greig. “I know the song, so to speak,” Redmond says. “Depending on what you show her, she shows you something different. And Gruach is a woman of very little small talk. I admire those mysterious people who are happy to sit with silence. She has the fewest lines of any of the major characters, and yet the language of the play provides her with wonderful interpretive resources. Redmond speaks neither the Gaelic of her homeland nor Scots Gaelic, though Gruach and her attendants communicate in the ancient tongue — an utterly impenetrable code to the occupying English. But Greig’s queen is fluent in the language of her captors.